In a large bowl, combine 2 Tbs. of the oil, the garlic, chopped ginger, mustard seeds, turmeric, and 1/2 tsp. salt. add the shrimp and toss to coat. In a small skillet over medium-low heat, toast the cloves, coriander seeds, cardamom pods, cumin seeds, and fennel seeds, shaking the pan frequently, until aromatic, about 1 minute. Transfer to a spice grinder, and pulse until finely ground. In a medium bowl, add the spices to the coconut milk, and set aside. In a small Dutch oven or other heavy-duty pot, heat the remaining 2 Tbs. of oil over medium-high heat. Add the julienned ginger, jalapeños, and curry leaves, and cook for 2 minutes. Add the coconut-milk mixture, stock, lime juice, and sugar, and bring to a boil. Reduce the heat to medium low, then add the shrimp, tomatoes, and 1-1/4 tsp. salt. Cook until the shrimp are bright pink, 2 to 3 minutes. Stir in the rice and chopped cilantro. 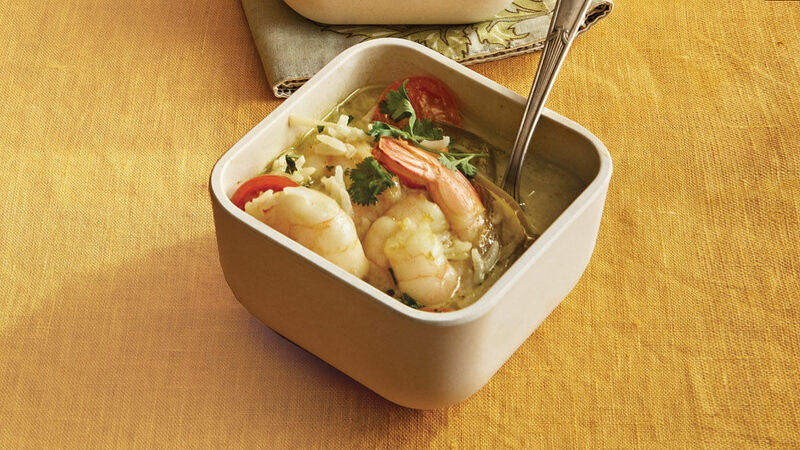 Divide the soup among warm, shallow bowls, garnish with the cilantro leaves, and serve with lime wedges. This is an outstanding recipe. The blend of flavours is what makes it. I followed the recipe exactly and the only change I would make next time is to remove the shrimp tails. They add nothing and make eating messy. Loved it! Made a few changes based on what I had and didn't have on hand. Made a little shrimp stock with the shells, then used this in place of some of the chicken broth. Omitted curry leaves and added some lime zest. (I don't know where to buy curry leaves.) Along with the tomatoes, I added some cut-up sugar snap peas and a handful of spinach. These additions made it a complete meal. My husband is waiting for me to make it again.